In response to ongoing concern and public outrage over players kneeling during the national anthem, the NFL announced today that all players on the field must henceforth stand while it is played. Players now have the option of staying in the lockerroom during the anthem without penalty, but teams will be subject to a fine should any player on the field diverge from standing. As expected—and as has been the case since Colin Kaepernick first knelt before a game in September 2016—reaction is both heated and extreme, revealing many layers of emotional history for everyone participating and watching. As the pre-game kneeling drama continues on, the conversations taking place around the gestures grow more disturbing every day. The protests themselves will eventually fade, but the lack of understanding on both sides may not. That’s concerning. Our national inability to have civil discourse around difficult subjects is alarming. While there’s no shortage of anger to go around, patience and a willingness to empathize seem scarcer by the day, making genuine communication and actual learning rare in the midst of the nasty rhetoric. People are upset on all sides—and rightfully so—and they are more than prepared to let everyone know about it. Scrolling through social media rants by both Christian and non-Christian friends, it’s disturbing how little historical perspective we bring to discussions on behalf of the people with whom we disagree. Everything is knee-jerk and visceral, self-centered and myopic. Very little that gets exchanged is helpful, even less brings healing. Regarding Christians, it’s surprising how little actual discussion and debate exists on social media around Biblical ideas like “justice,” “humanity in the image of God,” “reconciliation”—even “grace”—all themes begging for engagement as each new round of players kneel. Instead, a glut of posts involve hurling insults back and forth in a way that’s hardly befitting those destined for another kingdom. We don’t seem much interested in learning or growing anymore and that’s disappointing. Many struggle with accepting that a symbol can mean different things to different people at the same time. In particular, there seems to be an historical gap regarding the African-American experience and why they might view the national anthem, the flag, law enforcement, and perceptions of justice through a very different lens. I assume this gap exists mostly for White folks, who inherently own the option of not paying attention to that history unless it’s forced upon them. But if a person genuinely wants to understand what’s going on beyond the immediate offense of the Sunday afternoon kneeling, engaging that history becomes a necessary place to start. If you already have your thinking solidified regarding the players kneeling and feel there’s nothing more to learn or think about the issue, then this essay won’t be helpful. But if you choose to continue, know in advance that this will not be an easy read. It is neither short nor comfortable, but in tracing several historical yet ignored realities, what follows may add perspective to your future conversations. I came across two gut-stirring conceptions of the flag recently, both with disturbing but important implications for all of us. The picture above is a mash-up by Cleveland.com editorial cartoonist Jeff Darcy. 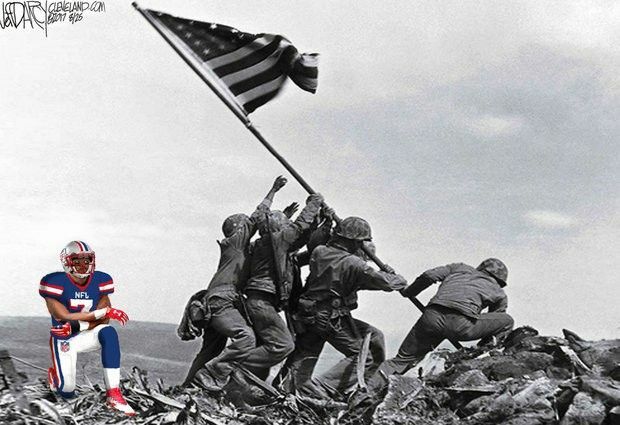 Darcy juxtaposed an iconic, emotionally charged black and white symbol of American sacrifice—the flag being raised victoriously by soldiers into the bloodstained terrain of Iwo Jima—with an almost cartoonish, irreverent looking color shot of a player kneeling comfortably in their shadow. “Americans stand for the national anthem and the flying of the flag to honor what they represent, the highest ideals of the nation and those who fought and died for those ideals. The anthem and flag, that the players are slighting, represents the best of what this nation stands and hopes for. They do not represent the societal failures the players are protesting. The contrast is alarming and should illustrate to anyone shrugging their shoulders at players kneeling that against this backdrop, folks who fought have good reason to be offended. Many people wholeheartedly agree with Darcy on this point. If you don’t, before offering resistance to the message he’s communicating, take time to at least appreciate it. Many years of emotional narrative lie behind images like the one above for every American—regardless of racial heritage. Pause long enough to let it sink in. But after pausing, recognize that for many others the anthem and flag actually _do_ represent the societal failures the players are protesting. What if the kneeling players targeted the anthem moment precisely because they believe it should “represent the best of what this nation stands and hopes for,” but many elements of their experience suggest that it’s still not happening? Contrast Darcy’s framing of the flag with this one. 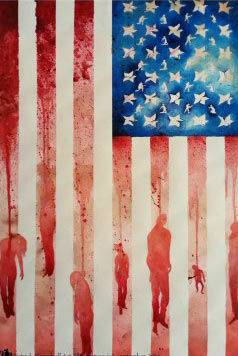 This is “The New Age of Slavery”, a painting by Washington, D.C., artist Patrick Campbell. Campbell painted it in response to Eric Garner’s 2014 death. Garner is the NYC man who resisted being arrested for selling loose cigarettes, then wound up dead after a police chokehold triggered asthma and heart failure as he plead with officers that he couldn’t breathe. None of the officers were charged, including the one administering the illegal chokehold that took him to the ground. Note the seven bodies being lynched in the red stripes—including a young child—blood from their bodies staining each band. Note the broken stars, surrounded by humans pointing guns down at folks on their knees begging for mercy. “I agree that my flag is disrespectful but it’s grounded on hard truths,” Campbell said. Not the “truth” of one man dying—although that would be tragic, it seems a singular death could hardly elicit such a dramatic painting—but rather the deaths of thousands of Black men over 400 years at the hands of people with power. He traced the motive for his painting across centuries—and continents. Campbell’s flag is disturbing, grotesque, offending. Darcy’s flag is proud, noble, offended. How can men living in the same cultural moment have such divergent views of the same flag? “How” has both a complex yet simple explanation: their conceptualizations have completely different histories in mind. Most people shouting back and forth at each other—whether Black or White—seem to genuinely understand why the player protests are offensive in the context of the anthem. But it’s equally apparent that a lack of knowledge exists concerning the Black experience in America among those who are unable to see the point of their protest in the first place. “Why are they doing this? How can they be so disrespectful? Why won’t they just play their game and leave politics out of it?” These are the gentler versions of anger we’ve read thousands of times on social media. As these reactions continue to pile up, if we actually want answers to those questions, a slice of Black American history could help fill the vacuum in understanding. Everyone—including the protestors themselves—seems to comprehend Darcy’s flag, but far fewer seem to have categories for Campbell’s. Why do Black folks have such a problem with law enforcement? What is their issue with the flag? Why “protest” anything at all? What you’re seeing on the field before these games is not just about the last few years—it’s about the last 400. If you find yourself aghast at the players kneeling during the anthem or if you conclude the police have “just been doing their job” in every one of the Black deaths the past few years, interaction with this extended and gruesome compilation regarding the history of lynching in America might help you understand a broader context for current manifestations of Black outrage. Take some time to scroll through that link. (Don’t do it before a meal or with young kids around.) Make sure to learn about Jesse Washington. Bennie Simmons. Henry Smith. Laura Nelson. Meditate on the pictures of them hanging grotesquely from trees and bridges and local landmarks in the towns they called home. Across centuries we find American law enforcement incriminated not only for what they’ve done regarding Black people, but even more often for what they have not done. Acquaint yourself with Emmett Till, the 14-year-old boy beaten, eye gouged out, shot in the head, thrown in the Tallahatchie River weighed down by a cotton gin fan tied around his neck with a barbed wire. Take in the view of his face people saw at his funeral. He was allegedly guilty of whistling at a White woman. Law enforcement allowed the two men who did it to walk free. That happened in 1955, when you or your parents or your grandparents were alive and could read about it in the newspaper. It’s not that long ago. In Without Sanctuary, historian Leon F. Litwack writes about the postcard industry that rose up in the early 1900s around the spectacle of public lynching. Think about the sentence you just read. Then take your time reading this disturbing paragraph. Black lives did not matter as police and law enforcement stood idly by while vigilantes hung more than 5000 Black bodies from post-Civil War trees across the country then took pictures of them to sell. They did not matter one hundred years after the Civil War ended, as Black lives were ruthlessly kept from society at every level and lynched—both literally and figuratively—every day across the country. Reasoning now that most cops are “good guys who are doing difficult jobs”—while true—is a convenience essentially unavailable to the educated Black person. For literally hundreds of years in this country, law enforcement actually supported the inhumane treatment of African-Americans—not as an exception but as a rule. That’s not a politically slanted opinion. It is an historically supported fact. Your African-American friends and their parents draw on this history whenever something negative happens with police. So do the Black players who are kneeling. People keep asking me what I think of the players kneeling before games. On behalf of my Grandfather and uncles who fought and bled in past wars for the opportunities I now get to take for granted, there can only be one right answer: It’s wrong. But limiting our interactions with one another to what _we_ think about their demonstrations is also wrong and misses the point. Of course it’s wrong. Of course players shouldn’t kneel during the national anthem. That’s the intention of the action—doing something that shouldn’t be done in order to get people’s attention. The purpose of a protest is to disturb the normal order, to disrupt in an effort to catch people’s focus and concern, especially those who have not responded to other, less offensive means of alert. It sounds ignorant to just keep pointing out how wrong their behavior is without ever transitioning to really struggling with why they’re doing it. They are purposely doing something wrong. Why? History repeatedly shows—and it has shown again in this case—that talking about injustice rarely works until somehow those with power feel or at least empathize with the pain. We should be asking these questions until we acquire understanding: What are these men or the people they represent experiencing that would cause them to do such a socially unacceptable thing? What are they begging us to see with these offensive acts? But when the post-protest discussion becomes entirely about cold water, tasers, and smelling salts instead of the injustice prompting those actions in the first place, we wind up spinning in circles and arguing among ourselves about secondary issues. One of the pivotal moments in the foundation of this country involved our European ancestors boarding boats and illegally pouring an entire shipment of English tea into the Boston Harbor, a disrespectful, insulting offense that had both symbolic and financial significance for the King of England whose attention they sought. The protesters didn’t have an issue with tea. They had an issue with what it represented (taxation without representation) and concluded among themselves that the only way to finally get the King’s attention would be to “disrespect” the very symbol that represented their concern. Assuredly, there were British citizens who argued for weeks after the protest occurred, debating among themselves over “Those uppity dissenters and their hatred for tea!” and “What kinds of tea could justly and perhaps even deservedly be thrown into a harbor” and “Knowing how much tea means to us as a people, how dare they desecrate the tea,” etc. While those conversations may have been interesting, they missed the point entirely. The King understood accurately, however, and translated their desire for just representation into an act of war. We all know how that turned out. Ironically, the very flag now in question was itself constructed and first flown as a symbol representing the success of their protest, a testimony to the just cause of their rebellion. But when the flag first hung proudly above government buildings and outside the homes of its citizens starting in the late 1700s, it didn’t even have people of color in mind. In fact, the flag hung for ninety years in this country while people brought from Africa worked as slaves under its symbolic stars and stripes. Then, for the next hundred years after the Civil War, Black folks in this country were still forced to scratch and claw their way into White consciousness, pleading with people in power to acknowledge that the flag’s promises should include them, too. That pleading fell upon deaf ears decade after decade, until various forms of “offensive” civil protest finally captured people’s imaginations. An act of protest is supposed to offend, and Black folks throughout our history have been left with little choice but to offend norms or they’d still be without basic civil rights. Remember? It’s offensive to the norm when a person sits in a seat on a bus they aren’t supposed to sit in because they are Black. It’s offensive to the norm when a person sits at a lunch counter they aren’t supposed to sit at because they are Black. It’s offensive to the norm when a person moves into a neighborhood they aren’t supposed to move into because they are Black. It’s offensive to the norm when a person enters a school building they aren’t supposed to walk into because they are Black. But each of those offenses—acts of disrespect toward the current symbolic order of the time—brought change. If not for those offensive disruptions, we’d still be living in a completely segregated society. We should fear that far too many people raging today on social media and network airwaves would be fine with that arrangement—even within the Church—and that is a tragedy. We should fear that the current uproar isn’t really so much about the flag as it is a reaction to disruptive, justice-seeking Blacks—even if they’re also millionaire athletes—who need to be kept in their place. That’s our chronicled history as a nation, a shameful weight that continues to cloud current events—regardless of how far we’ve come on our collective journey. Now that we’re all being made to think about it, don’t be amazed that Black people are kneeling during the national anthem. Rather, be amazed that they’ve so willingly stood when for decades they were forcefully denied experiencing the very ideals it represents. Though much has changed in the last 60 years, we can easily argue that nothing would have changed apart from disruptive, offensive protest on the part of those whose voices were easiest to ignore at the time. Consider too that the player protest isn’t really about the flag—it’s about you. It’s about me. It’s about people who proudly sing “Oh, say can you see,” but then show with every Facebook rant against the players that they either can’t or won’t. Like the original makers of the flag whose protest wasn’t really about tea but about a king who ignored issues of justice related to the tea, these athlete-protesters aren’t against nylon and stitching and certainly aren’t against what the flag represents. They are against people who desecrate the ideals of the flag by selectively ignoring the purpose and meaning of the blue that surrounds its 50 stars: justice for all. Let’s move beyond marveling and hyperventilating at the insult of their action and start redirecting that energy toward asking more personal questions: What am I missing in my own education regarding the issues being discussed? What has the Black experience in America been and why does it matter today? Why are people within the same Christian faith arguing against one another primarily from political positions instead of theological ones? What does “justice” mean and look like in God’s economy related to the issues being discussed? “I don’t believe in the supernatural, but if there were a devil, he would be laughing his head off right now as we all whip ourselves into a murderous frenzy against each other,” said cultural critic Robert Tracinski. How then should people who _do_ believe in a devil respond to all that’s going on?